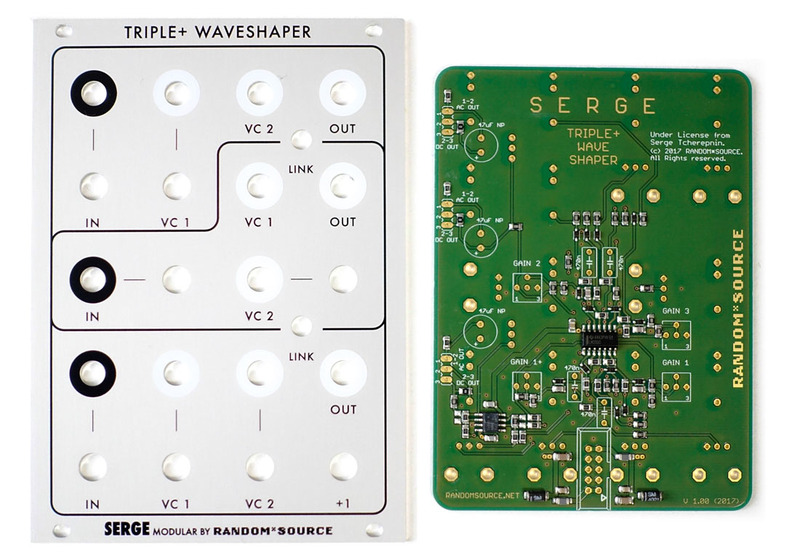 The TRIPLE WAVESHAPER (TWS) is a non-linear modifier which can transform a sawtooth wave into a sine wave. 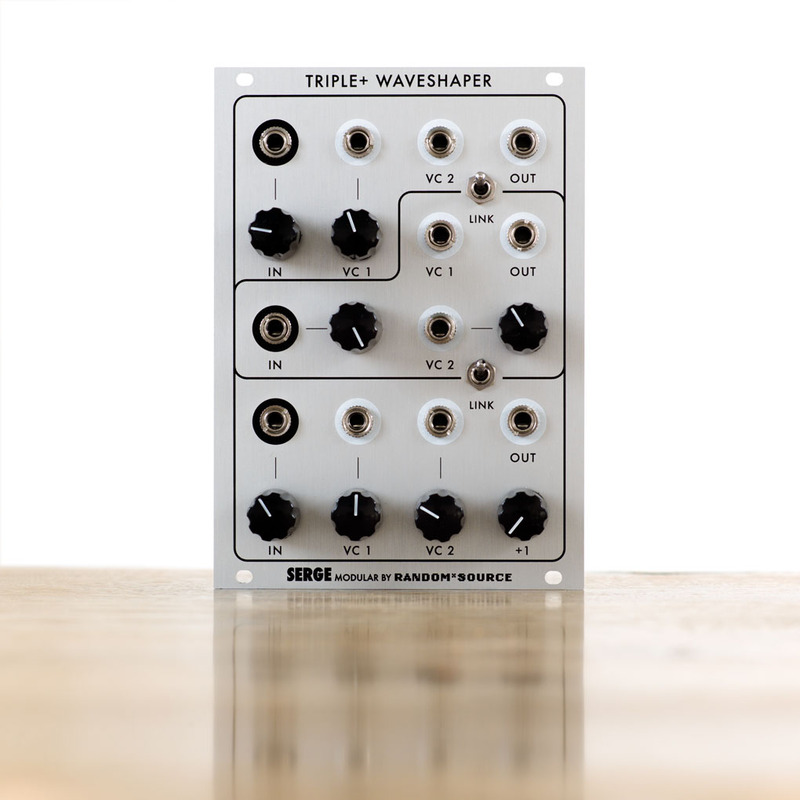 This classic module incorporates three independent waveshapers for modifying synthesizer waveforms or for processing signals from preamplified instruments. 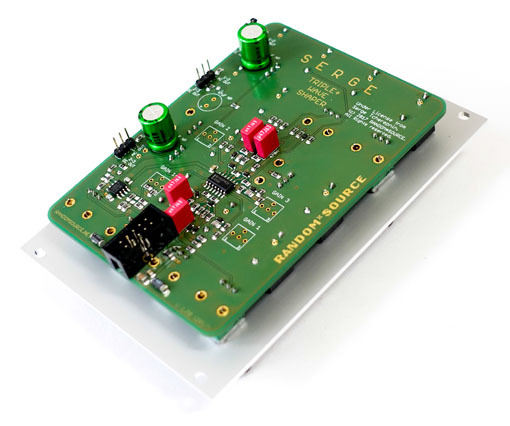 Although originally designed as a waveshaper for early Serge oscillators, this module has been found to be a excellent modifier of electronic and acoustic sounds, and is highly recommended for subtle timbral modifications beyond the range of simple oscillator/filter patches. +1: An additional (4th) waveshaper has been added (right after the first / bottom waveshaper) that can be dialed in smoothly using the +1 knob. Turned down (CCW) the bottom section acts as in the original (as if that additional waveshaper would not exist). Turned up (CW) the bottom section is actually 2 waveshapers in series. Switches to link the 3 sections - bottom to top. Using these switches all sections can be set to act in series, starting at the bottom and ending at the top, providing the combined effect of 3 to 4 waveshapers (or anything in between) using the +1 knob. Linking only the middle and top section and turning the +1 knob up (to have 2 sections in the bottom) allows you to use the module for isntance as two independent 2-stage waveshapers (using bottom in and out for one and middle in and top out for the other) - e.g. for stereo processing. The Random*Source version is a licensed and authorized adaption of the original Serge design.